Back for its second edition, the Geordie Theatre Fest offers families in the Greater Montreal Area something for everyone. Award-winning Canadian playwright Marcus Youssef’s World Premiere of The In-Between for teens! Music, enticing visuals, and tactile experiences transform everyday objects into fabulous, fanciful phenomena for babies and adult companions alike in Geordie’s first-ever presented show for babies! When the show is over, kids and caregivers can experiment with objects from the play right on the set – to have their own additional play experience. One Thing Leads to Another is sure to engage, stimulate and delight baby and parent or adult companion alike. Presentation duration: 60 minutes; includes 30 minutes of interactive PLAYTIME immediately following the 30-minute performance. Every year, Geordie Theatre commissions two new plays from seasoned playwrights, invites some of Montreal’s finest directors to the studio, casts three outstanding emerging actors and produces two plays, simultaneously, one for children and one for teens, that are packed up in a 320-cubic foot van and hit the road for the Geordie 2Play Tour. Every year, the troupe performs both plays in schools, community centres and libraries across cities and remote regions of Quebec, Ontario and the Maritimes to some 40,000 kids over a period of 7 months. The 2Play Tour is Canada’s longest running and furthest reaching annual theatre tour. In February, after having traveled thousands of kilometres, Geordie’s 2018-19 2Play Tour will get unpacked and receive the professional mainstage treatment for a limited engagement. Translated by Alexis Diamond from the French play Petite Sorcière by Pascal Brullemans, Little Witch is a heartwarming, poetic and thrilling fable for children about big choices, featuring highly imaginative performances, playful scenic design, and enchanting storytelling. Upon the passing of her mother, Little Witch is forced to live with an Ogre. When the curious Hunter Boy strays too close to their dwelling, Little Witch is forced to make a difficult choice. Following the outstanding success of his play Jabber, created with Geordie back in 2012 and seen by over 100 000 teens across North America and Europe since, recent recipient of the prestigious Siminovich prize for Excellence in Theatre, Canadian playwright Marcus Youssef returns to Geordie with The In-Between. When Lily’s best friend Brit and the guy she likes Karim conflict over racist, anti-Muslim memes, a misunderstanding leads to a school lockdown. Lily finds herself right in the middle, forced to make hard choices about which friend’s truth she’s going to believe. Geordie Theatre is Montreal’s leading English-language professional Theatre for Young Audiences, entertaining and engaging the imaginations of children and their families since 1980! Geordie celebrates the art of theatre and its impact by working with emerging and established artists from various disciplines and cultural backgrounds to create theatre that is provocative, relevant and enchanting; inspiring dialogue between communities, children and parents as well as teachers and students of all ages. 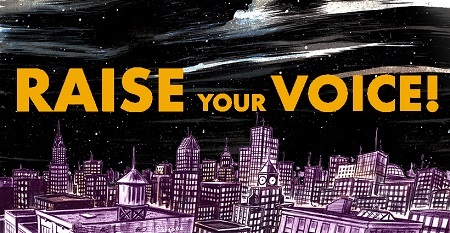 2018-19 Season: Raise Your Voice!